It’s best to buy the dry ingredients for this recipe in the bulk section of the grocery store. Many grocery stores have a bulk section which includes organic oats, pumpkin seeds, et cetera. Buying in bulk allows you to buy only the amount you need for this recipe. The dry ingredient measurements in this recipe are also quite forgiving. 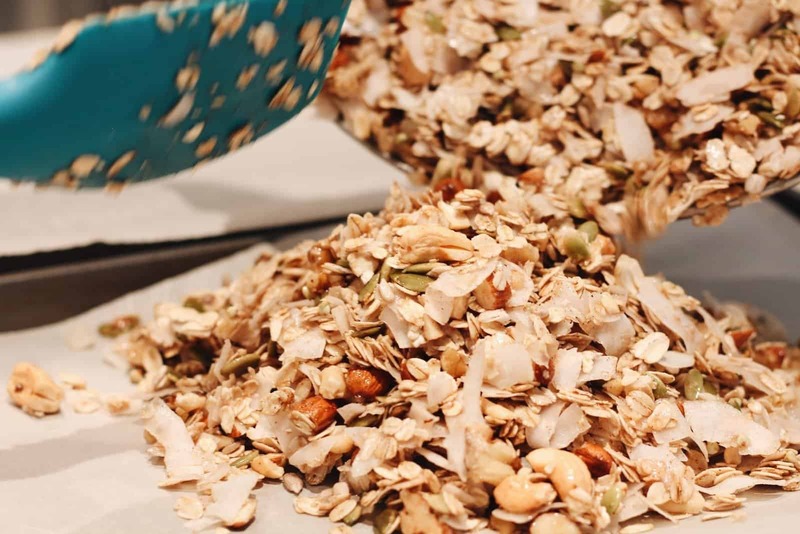 If you buy a few too many oats or a few too little pumpkin seeds, just use what you have and the granola will turn out just fine. I usually make a double batch of this recipe. It takes a little longer to prepare and cook it all, but not twice as much time! I use two big mixing bowls instead of one. This makes about a month’s worth of granola for the two of us (or lots of gifts!). If you find this recipe too sweet, reduce the maple syrup to your taste or serve with unsweetened plain yogurt or kefir. If you find this recipe not sweet enough, add extra maple syrup or serve the granola with sweetened flavoured yogurt. For a vegan sweetener option, use agave or another favourite sweetener in place of honey. 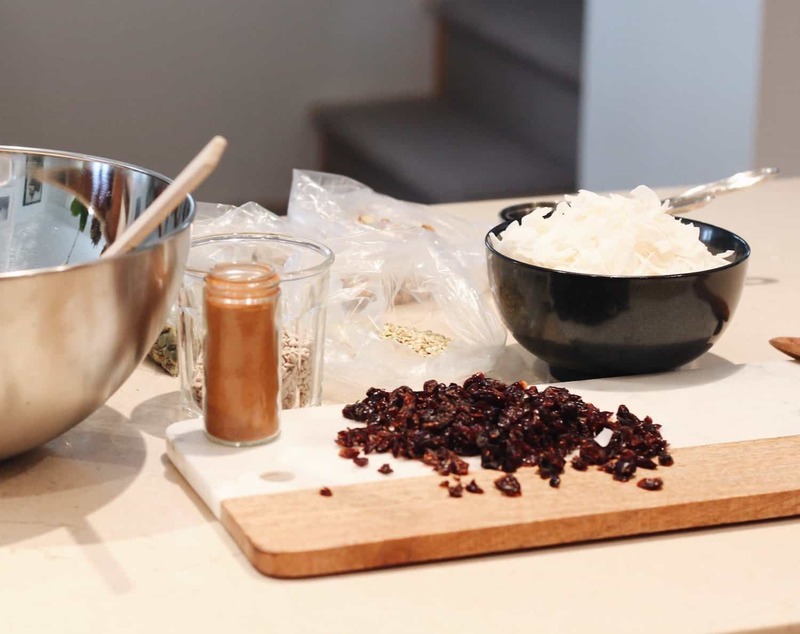 In a large mixing bowl, combine the oats, nuts, seeds, buckwheat, and spices. Mix well to coat the dry ingredients with the spices. Gently mix the coconut ribbons into the dry ingredients, being careful not to break them too much. In a small saucier, combine the oil, honey, maple syrup, vanilla, and sea salt. Heat slowly on the stove over low heat, just until the mixture flows easily. The oil and honey may separate in the pan (and that’s ok). Pour the warm liquid over the dry mixture, stirring as the liquid is added. Mix until all the dry ingredients are coated well. Spoon the mixture onto the lined baking sheets. One batch should fit on 2 regular-size baking sheets, or 4 small baking sheets. Bake at 325 degrees Fahrenheit. Stir every 10 minutes until golden brown. Baking can take anywhere from 20-40 minutes depending on your oven (I’ve even made granola on the BBQ in the summer!). Store in a ziplock bag or in a pretty glass jar. This granola can even be frozen if you can’t eat it all right away. Serve with almond milk, yogurt, kefir, or on top of an acai bowl. Have you tried this recipe? What worked well, and what was tricky? How did it turn out? 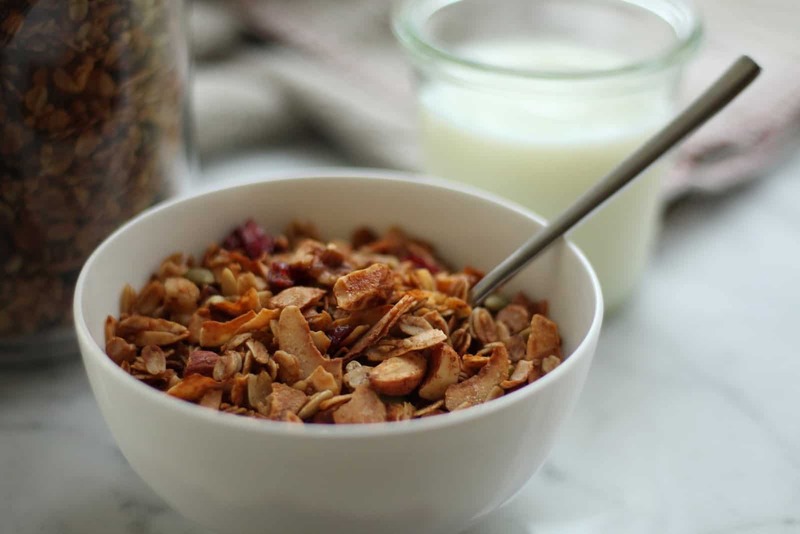 Share your granola experience in the comments section below! I would love to bring this to work with me! What is cardamom like by the way? I always kind of assumed it was similar to cinnamon but I could be entirely off! It’s perfect to bring to work! I used to keep a ziploc bag of it in the fridge at work and snack on it with yogurt throughout the day. Cardamom is often paired with cinnamon, but it’s a seed pod rather than a bark. You can see the seed pods in some Chai Tea mixes when you buy it loose leaf. Cardamom smells and tastes entirely different than cinnamon though…I can’t really describe it, but it’s brighter and more alive somehow. Let me know if you like the scent if you get a chance to find some Cardamom :) It’s definitely a chai tea lovers dream. This looks super tasty! Can’t wait to try it for myself. I’ve never met a granola I didn’t like! So true :) there’s nothing like homemade granola! I am always eating snacks like this. One of my favorite things to eat AND healthy! Healthy and yummy is definitely the best combination :) Thanks so much for stopping by! Thanks so much! Let me know how it goes :) Happy baking! My kids would love this. I think we should all make it together as a little project. That’s so fun! It’s so satisfying to eat “breakfast cereal” that you’ve actually made yourself :) Let me know how it goes! I first made this recipe several months ago…trial and error with the oven time, but I finally have the perfect amount of baking time. I’ve since made 5 more batches – I gave it to my friends for Christmas in lovely Kilner sealer jars. This is the best granola I’ve ever had. The only thing I have decided to omit in my future batches will be the buckwheat groats – they were a little too crunchy. I now look forward to breakfast for a change! Thanks for such a well written recipe…I appreciate how you describe the process so I was sure I wasn’t going to fail! My friends all LOVED their Christmas presents too! This looks delicious! Anything gluten free is great in my book!! Thank you Home for the Harvest for the best granola ever! I am obsessed with oatmeal lately and this recipe looks amazing! Pinning this to make next week! This recipe is spot on! For the past few months, I’ve been making a monthly batch and bringing it to my remote work camp. It’s by far my favourite (and healthiest) meal of the day. That’s so wonderful to hear that it’s your favourite :) Granola does travel well…it’s a great portable snack. Thank you so much for trying this recipe out, and for the feedback! Yum! This looks delicious and perfect for Fall! Thanks so much! 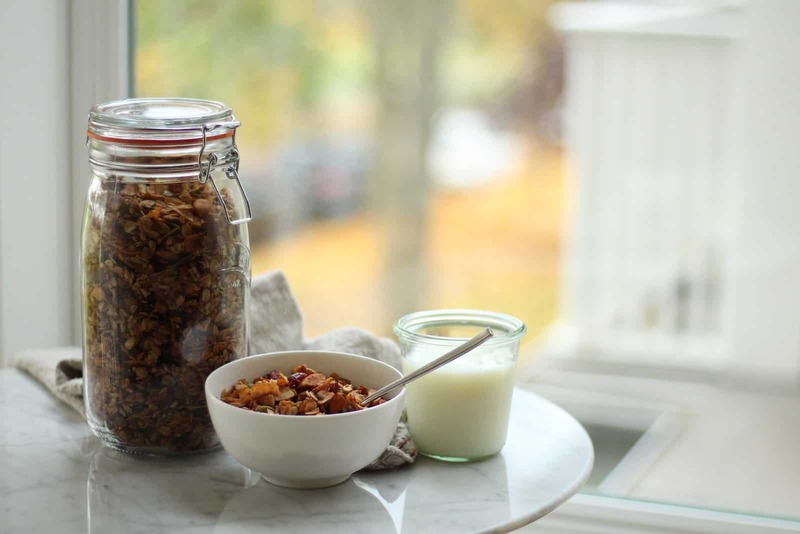 And you’re right…warm roasting granola is enough to fill a kitchen with a warm delicious Fall scent just as the leaves start to turn bright colours. 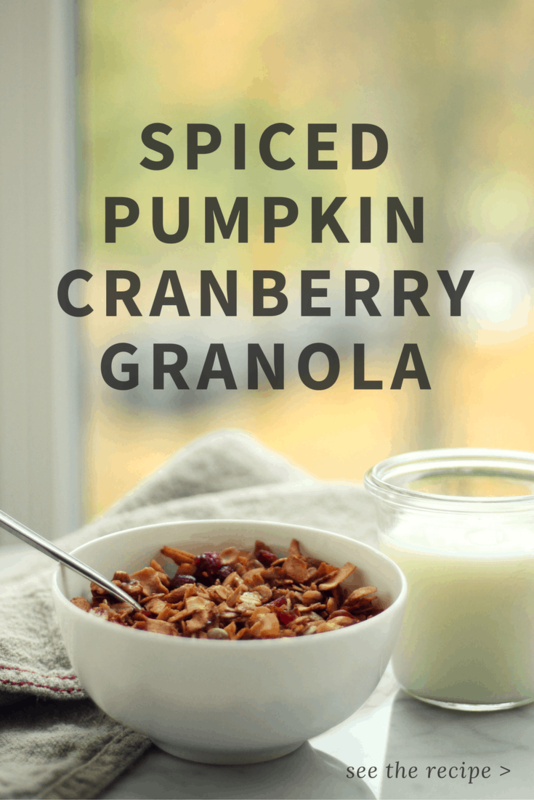 What a lovely combination for granola! Yum!!! Great recipe! Thanks for that. I will make sure to try it out. Thanks so much Carola for stopping by, and for trying this recipe out! I can’t believe as a food blogger I’ve never made granola. Sounds like the perfect snack to me! 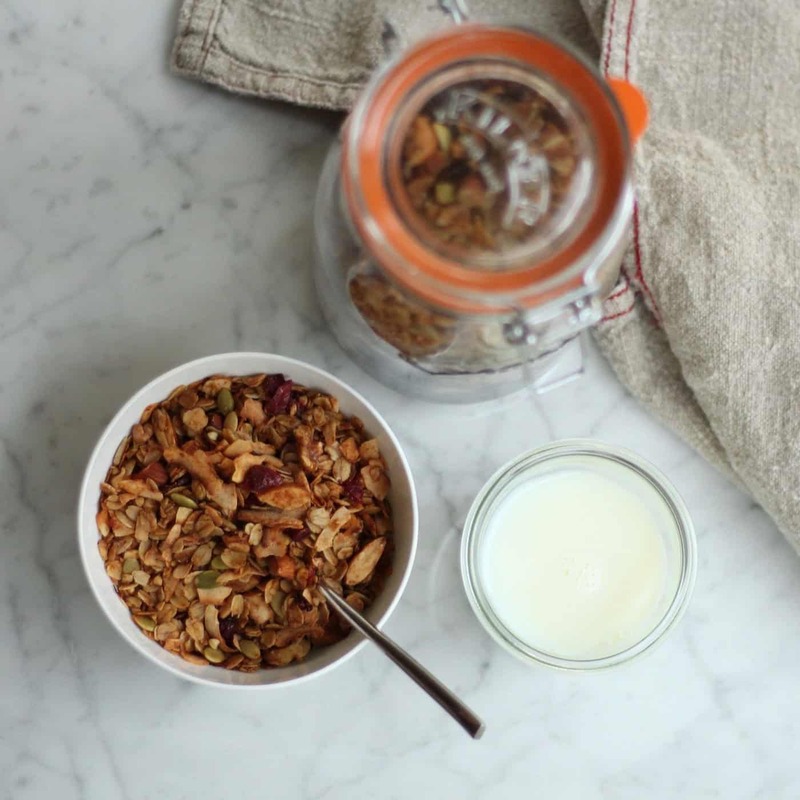 This is definitely the best granola recipe I’ve tried. We make it every few weeks now and have it with yogurt each morning. We try not to eat much refined sugar or gluten, so this is a perfect breakfast for us. Thanks so much for the great recipe! Wow, thank you :) I’m so glad you guys are liking this recipe and that you’ve got a healthy breakfast now. Thanks for the kind words!